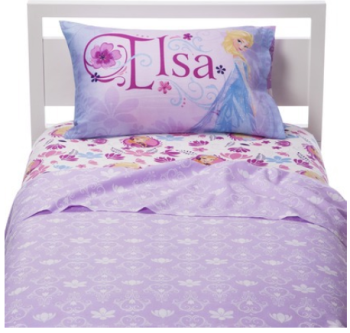 Thanks to the awesome Black Friday sale at Target.com, you can pick up the Disney Frozen Anna & Elsa sheet set (twin) for only $17.59 through 7/19/14. Don’t forget to check out these other super Black Friday deals from Target.com. The $21.99 price is already 20% off and you can’t buy this online, only pick up in the store. The $21.99 is the regular price, so you should get an extra 20% off that price if you are buying it from Target.com and having it shipped to your home. I don’t think you will get the extra 20% off if you pick it up in-store. It looks like it is now sold out online.